Dear Applicants, If you are searching Jobs in HAL Lucknow then here is good news for you. Hindustan Aeronautics Limited has now released recruitment notification of 131 Operator Vacancies under Lucknow Region. All the candidates who are interested in HAL Recruitment 2018 can fill online form here till the last date. Closing date for submit online form for HAL Lucknow Vacancies is 14.02.2018. 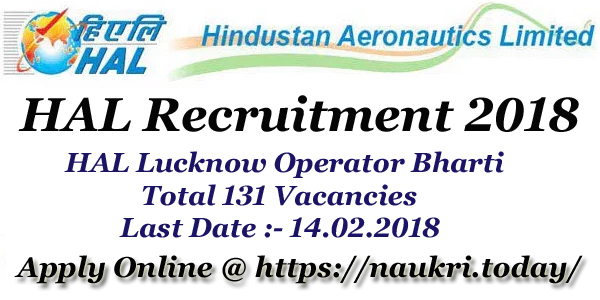 HAL Lucknow is inviting online application for filling up 131 Operator Vacancies. Submission of Online Form for HAL Vacancies has been started from 25.01.2018. Applicants who are going to fill online form for HAL Lucknow Recruitment should check required eligibility criteria & other Details. Rest of information about Education, Age, Fees, Pay Scale & Other you can collect from below article for HAL Operator Jobs. How To Check Pay Scale, Application Fees & Selection Criteria For HAL Vacancies ? How Can I Fill Online Form For HAL Recruitment 2018 For 131 Operator Jobs ? How I Fill Online Application for Lucknow HAL Recruitment 2017/ HAL Operator Jobs ? What is the Required Qualification for Nasik HAL Recruitment 2017/ Eligibility Criteria For HAL 500 Apprentice Jobs ? How I Fill Application form For HAL Recruitment 2017/ HAL Nasik Apprentice Jobs ? Applicants, in this section we are providing Category & Trade wise division of HAL Vacancies. You can also check this details from Official HAL Lucknow Jobs Notification, which is shown below. In this section we are providing Required Education & Age Criteria For HAL Vacancies. If you are going to fill online form for Hindustan Aeronautics Limited Jobs then check the below section, which provides you required eligibility criteria. Candidates must have passed 10th Standard from recognized Board & Having ITI Certificate in respective trade. Applicants must completed ITI Course from any authorized Institute for HAL Operator Recruitment 2018. Upper age of the candidates for HAL Lucknow Jobs 2018 must be 28 years as on 01.01.2018. Relaxation in age for HAL Lucknow Vacancies is applicable up to 05 years for SC/ST Category & 03 years for OBC Category candidates. Rest of the details you can collect from official notification. Candidates need to pay Rs. 200/- as application fees for applying online form for HAL Recruitment 2018. Candidates of SC/ST/PWD/BC Category are exempted from paying application fees . Fees must be deposit through Online Mode through Debit/Credit/E Challan. Selected candidates will paid a good salary as per organization norms. After joining candidates will paid Rs. 40,000/- per month + Other allowances for HAL Vacancies. Check More details from official notification. Candidates will selected for HAL Lucknow Recruitment 2018 will made on the basis of Written Examination & Merit List. Selection will made on the basis of Marks obtain in examination. Candidates must get minimum qualifying marks for passing the exam. Check more details about Examination from HAL Lucknow Jobs Notification. First of all candidates log on to the official website www.hal-india.com. Now click on Career Section & click on official HAL Jobs Notification link. Now click on Apply Online form link. Fill all required information in HAL Lucknow Jobs Online form. Upload your scanned photo & signature in form. Check all details before submit online form. Click on submit button & Take print out of application form for future use. Conclusion : HAL Recruitment 2018 For 131 Operator Jobs. Candidates can fill online form for HAL Lucknow Vacancies on or before the last date that is 14.02.2018. Check out more details by reading the above article. Hindustan Aeronautics Limited has released recruitment notification of 173 Operator Vacancy of Various Stream. Candidates who are interested in HAL Recruitment 2017 can fill online application from here. Online registration for HAL Lucknow Vacancy has been started from 03.05.2017. Last date for applying application form for Operator Jobs is 16.05.2017. Fresh Update as on 22.12.2017 : Applicants, HAL has now released Apprenticeship Training Notification for Lucknow Region. Those candidates who are interested in HAL Lucknow Apprentice Jobs can fill form her. 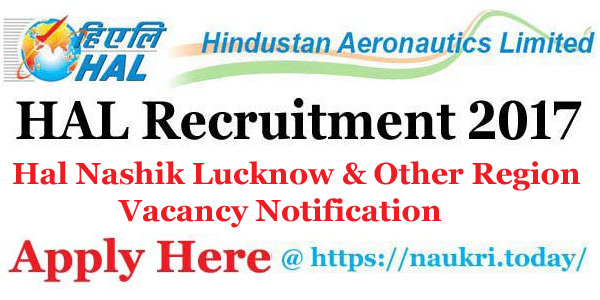 Link for Hal, Lucknow Vacancy & Application form is mention at the end of the page. HAL Lucknow is inviting online application for recruiting candidates on 173 Various Operator Jobs. Those applicants who are waiting for Jobs In Uttar Pradesh State can fill online form for HAL Operator Vacancy 2017. Candidates are advise to check Eligibility Criteria before applying online Application. For more information about HAL Online Application, eligibility Criteria etc. you can check given below details. Fresh Update as on 19.12.2017 : Dear Applicants, HAL, Odisha region has released notification of 70 Technical Operator & Paramedical Staff Vacancies. Candidates who are interested in HAL Recruitment can fill online form till the last date 08th January 2017. Notification is shown at the end of the page. Lucknow HAL Operator Recruitment 2017 Education Qualification : Candidates should passed 10th standard + ITI in machinist/ Turner/Grinder/ Fitter/ Electronic Mechanic/ Instrumentation Mechanic from any recognized University/ Institute for HAL Lucknow Recruitment 2017. Lucknow HAL Jobs 2017 Age Limit : Maximum age of the candidates for HAL Recruitment 2017 should be 28 years as on 01.02.2017. Age relaxation is applicable up to 05 years for SC/ST Category & 03 years for OBC Category candidates for Hindustan Aeronautics Limited Vacancy 2017. Pay Scale For HAL Lucknow Vacancy 2017 : Selected candidates will paid Rs. 26,342/- per month for HAL Vacancy 2017. You can check more information about pay scale of HAL Lucknow Operator Jobs from official Notification. Application Fee For HAL Lucknow Recruitment 2017 : General/OBC category candidates need to pay Rs. 200/- for filling online form for HAL Lucknow Vacancy 2017. SC/ST/PWD/ESM candidates are exempted from paying application fee for HAL Recruitment 2017. Fees should be deposited through Demand Draft. Candidates should send Original Copy of Demand Draft on Correct postal address which is given below at the end of the page. Now click on official HAL Jobs Notification link. If you are eligible then click on Apply Online Link. Fill all the required information in form without any mistake. Upload your recent passport size photo & Signature in form properly. Recheck all details in form before submission. HAL Recruitment 2017 for 173 Operator Jobs. 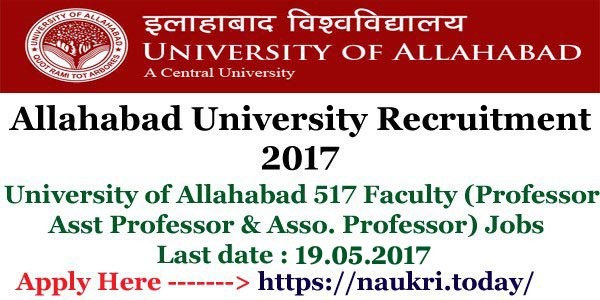 candidates can apply online application for HAL Lucknow Vacancy 2017 from here before the last date 16.05.2017. Candidates who are waiting HAL Recruitment 2017, here is good news for you. Hindustan Aeronautics Limited has released recruitment notification for engagement of 500 Trade Apprentice in HAL Nasik. Candidates who are interested in HAL Nasik recruitment 2017 can fill application form through offline mode from here. You can fill prescribed application form for 500 Apprentice jobs on or before the last date 15.05.2017. Hindustan Aeronautics Limited is inviting online application for recruiting candidates on 500 HAL Apprentice Jobs. This is great opportunity for all the candidates who are waiting for HAL Nashik Vacancy 2017. submission of application form Hindustan Aeronautics Limited Nasik Vacancy has been started & you can submit application form till closing date of Application form. For more details about HAL Fitter Vacancy 2017 like Age Limit, Education Qualification etc. you can check from given below details. Nashik HAL Fitter vacancy 2017 Education Qualification : Candidates must have passed Matriculation with ITI in respective Trade from any recognized Institute for HAL Nasik Recruitment 2017. Age limit For Nasik HAL Jobs 2017 | age Criteria For HAL Nasik Fitter Application Form : Minimum Age of the candidates for HAL Recruitment 2017 should be 18 years. Upper age limit & Relaxation in age is applicable as per Department norms for NK HAL Vacancy 2017. Nasik HAL Fitter Jobs Application Fee : There is no need to pay any application fee for filling application form for HAL Apprentice Recruitment 2017. Pay Scale/Stipend For Nasik HAL Recruitment 2017 : Selected candidates for HAL Nasik Apprentice Jobs will paid pay band as per Department rules & regulation. For Apprentice Vacancy, Department will paid Monthly stipend don the basis of Apprentices Act 1961. Nashik HAL Fitter Recruitment 2017 Selection Method : Selection of the candidates for Nasik HAL Recruitment 2017 will based on Merit List. Merit slits will prepare on the basis of qualification Marks. Candidates should keep visit Official website or here for Merit List Details. All the future update will uploaded here about HAL Vacancy 2017. First of all candidates log on to the official website www.hal-inida.com. Now click on career Section & Find Nasik HAL apprentice recruitment Notification link. Now candidates log on to the Apprenticeship.gov.in & Fill the Registration Form. Then Click on Download Application Form Link for HAL Nasik 500 Apprentice Jobs. Fill all required information in form without any error with Apprentice Registration No. Attach your recent passport size photo & other required documents with application form. Now send the application form on correct postal address before the last date. Nasik HAL Recruitment 2017 For 500 Trade Apprentice Jobs. Candidates can fill application form for HAL Nasik Recruitment 2017 on or before the last date 15.05.2017. Sir ji hal ka from oplaye nahi ho raha hai please kaise from ko bhara jaay kripya aap websaid tusra bata the?